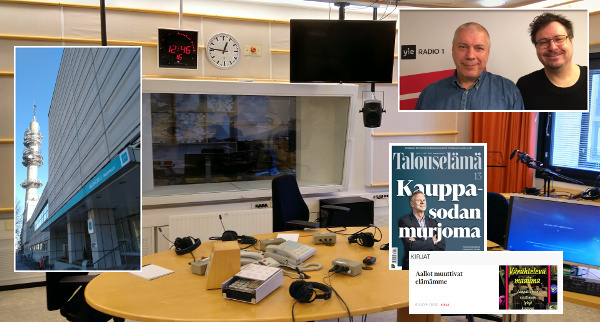 After the Finnish translation of my book “A Brief History of Everything Wireless” came out, I received an email from Kalle Haatanen, who runs a weekly radio show on topical subjects on the nationwide YLE Radio 1 channel - the leading news and facts-oriented channel in Finland. He had read the book, liked it very much, and wanted to interview me in his hour-long show. As I was still living in Brazil at the time, the required logistics did not immediately give space for a "brief" visit to Finland, but as my potential new work assignment in Barcelona was already being negotiated upon, this was not an entirely impossible prospect in the longer run. And as I soon moved to Barcelona to work as the CTO of Datumize, popping in to Helsinki for a day or two was again just a simple cross-European flight away. Therefore, on the 4th of April, I found myself at the studios of the Media House of YLE in Helsinki, recording an hour-long interview over some of the subjects in my book. This interview, which was conducted in Finnish, was broadcast on 12th April, and is available on YLE Areena. As of today, it has been listened to over 6,000 times. One of the greatest inventors of all times, Nikola Tesla, predicted in 1928: “When wireless technology is fully deployed, we will communicate with each other without delay, independent of distance. The devices used for this are amazingly simple, and everyone can carry one in their pocket”. And simple they are, but only at the surface. Mobile phone and the system used to transfer mobile data is everything but simple. This is brought out by Launiainen both interestingly and in an entertaining way.